For the tough-as-nails lady of the house, we have our gun-toting female gnome, complete with boots, camouflage gear and trusty rifle! She also comes complete with plenty of attitude, and is the perfect gift for the woman who won't take "no" for an answer. Present one of our female gnomes to that special lady in your life, and you'll instantly be on her good side, which is exactly where you want to be. This rugged female bounty hunter gnome, 14 inches tall and weather resistant, will have a commanding presence at your front door or on your patio. 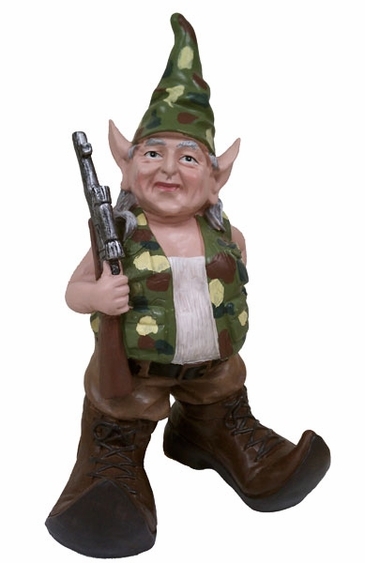 Purchase our popular Hunter Gnome too, as they make the perfect pair.